Caldera is working on a new easy-to-use configuration tool for Linux. Mr. Kirch gives us the details. 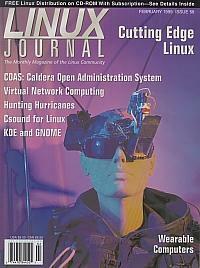 Mr. Phillips discusses some history as well as what's happening now in the Linux Csound world. The authors tell us about hunting hurricane using the Scanning Radar Altimeter based on the Linux system and analyzing the data with Yorick. Dr. Mann describes his WearComp (“Wearable Computer”) invention and how it has evolved into the same kind of philosophical basis for self determination and mastery over one's own destiny that is characteristic of the Linux operating system that currently runs on WearComp. Mr. Harvey tells us about virtual network computing and how to set it up to control MS Windows Application from Linux. This article describes how to configure Linux-based PCs and an asynchronous transfer mode (ATM) switch to build on ATM network. What is GNOME and where is it heading? Miguel tells us all. In this article, Mr. Dalheimer describes some of the plans being made for future versions of KDE. This month Mr. Guerrero tells us about the definitive proxy-cache server, Squid. Mr. Lerner continues to look at the bulletin board system, examining the code that works with individual messages. Software Libre and Commercial Viability Mr. Rubini gives us his opinion of the Open Source movement. Mr. Poag describes the InSight project which is designing a desktop where color is used to inform the user of what is happening with his applications.